Companies are sliding off this mortal coil. The average lifespan of today’s organization is shorter than that of the average employee. Seismic global shifts in social, technological, economic and political systems are converging. They are evolving from an already Volatile, Uncertain, Complex and Ambiguous economic ecosystem into a powerful VUCA vortex that is destroying many institutions and organizations it finds in its path. More than half the Fortune 500 organizations have been wiped out since 2000. Those that remain are fighting for their lives in an era of digital Darwinism as the wants and needs of society are emerging and evolving much more rapidly than organizations can adapt to address them. As digital connectivity of people and things grows exponentially, survival anxiety within organizations is compounding rapidly. More than 86% of executives anticipate that the pace of change will increase significantly over the next three years. And two-thirds of them believe the next 36 months will be more critical to their industries than the previous 50 years. Industry leaders believe that roughly four of the top ten incumbents in terms of market share will be displaced within the next five years. Organizations must adapt or die. Today’s institutions and organizations were not designed to withstand the destructive power of the VUCA vortex. Most of them came into being during stable and predictable economic times, when markets were unsaturated and customer needs were predictable. Today, organizations and institutions are disappearing at increasing rates because they are failing to adapt to the increasing complexity of the economic ecosystem. To survive digital Darwinism, organizations and institutions must evolve into ‘instant enterprises’ that maintain a perpetual state of readiness to respond to the unexpected. The internet and its social and mobile offspring enable a near-frictionless flow of information across a vast global digital network that facilitates rich human exchanges without the need for formal organizational structures. As a result, the traditional organizational hierarchy that segmented work functionally and cascaded information from top to bottom is evolving into a ubiquitous flat, open, networked wirearchy that extends well beyond the boundaries of enterprise. The modern-day enterprise is a large and complex social system with many interrelated parts. When changes are made to one part of the organizational system, many other parts are impacted – often in unanticipated and counterintuitive ways. It is more appropriate to conceive of ‘instant’ enterprises as organisms rather than machines. Instant enterprises avoid extinction by operating within an economic ecosystem as organisms that anticipate marketplace needs and respond by convening the constellation of people, systems, processes and technologies required to fulfill them. The primary evolutionary challenge to achieving enterprise instancy reflects Welch’s famous quip. The Law of Requisite Complexity states that organizations must achieve complexity parity with their environment in order to survive and thrive. Regrettably, current organizational transformation efforts reveal that the mechanistic mental-model of enterprise still dominates. Instead of increasing organizational complexity, leaders are employing simplification strategies leading to structures that define boundaries, compartmentalize responses, standardize procedures and streamline coordination. Most transformation efforts involve yanking on discrete system, structure or process levers within the enterprise machine to eek out one more percentage point of market share, or to add a few more pennies to bottom line profitability. These discrete acts can contribute to the demise of the enterprise. Nearly half of all chief executives launch a reorganization during their first two years on the job. An astounding 96% of organizations are in some phase of transformation. Yet the inconvenient truth is that many of these transformation initiatives fall flat. Less than one-third of reorganizations have produced any meaningful performance improvement. And more than half of transformation exercises fail to be adopted and sustained. In short, organizational transformation efforts are sub-optimized because they fail to adhere to the law of Requisite Complexity. The key to surviving digital Darwinism does not lie in discretely transforming the organization’s structure, systems and processes from one static state to another. Rather, leadership must reject the dominant mechanistic mindset, recognize that organizations function more like complex adaptive organisms than machines, and apply a more holistic and systemic approach to achieving enterprise instancy. The world finds itself in a paradoxical situation where its dependence on leadership is greater than ever before – but where the pull of the VUCA vortex will require unlearning much of what we have previously known and believed about leadership in order to survive. The primary leadership challenge today lies in cultivating the capacity for instancy within institutions and organizations. Within an instant enterprise, value is created by groups of people who collectively sense impending shifts in their ecosystem and adapt to harmonize with these shifts in real-time. Adaptive actions at individual level are propagated via feedback loops to reshape the organization system itself. The organization’s evolved structure, in turn, influences the individual agents with the organization, resulting in a further evolution of the overall organization system. This is a complex adaptive property called Emergence. As these people continue to connect and collaborate, work and learning become intertwined and the organization evolves an intuitive ability to ride the waves of disruption rather than become crushed by them. To rise to the challenge of evolving an instant enterprise, we must conceive of leadership as the central nervous system that activates the organizational organism within an economic ecosystem. A VUCA-ready leadership system requires that individual leaders engage systemically to catalyze disparate and diverse sets of people, systems, processes and technologies in real-time to increase the likelihood of organizational survival. No group is more vital to organizational survival than those operating at the heart of the system. These people are Centre-Leaders. A perennial challenge facing every organization is ensuring that its strategy is executed in a way that maximizes value creation, delivery and capture. Today, the interdependencies between strategy formulation and execution are far more fluid and dynamic than in the past. Strategy and execution are no longer discrete problems to be solved at the top and bottom of the leadership hierarchy. Instead, they are two polarities that must be navigated from the centre of the leadership system. In proactively navigating the ‘Strategy/Execution polarity’, Centre-Leaders play a critical boundary-spanning role in ensuring the leadership system effectively balances and iterates around a top-down directive approach and bottom-up participatory approach to formulating and executing strategy. Developing a culture that fosters learning, collaboration, innovation and adaptability is fundamental to survival. 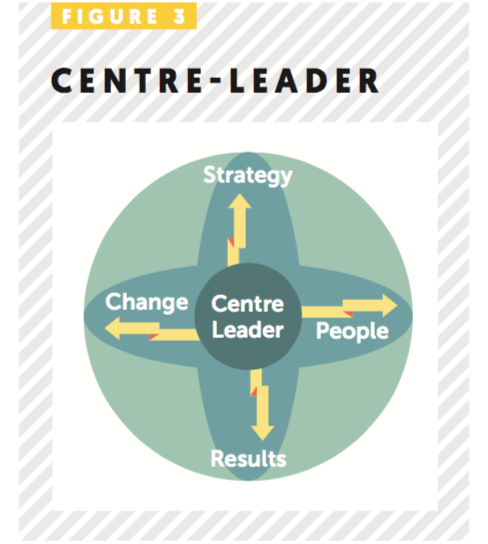 Centre-Leaders play a critical role in increasing the ability of others to respond to change by creating the conditions that encourage people to lead, follow, experiment, learn and adapt. In proactively navigating the ‘Change/People polarity’, Centre-Leaders ensure that innovation is nurtured and that people are fully engaged and motivated to adopt the next practices, routines and behaviours required to ensure organization survival and encourage ongoing renewal. Leaders at the centre of the organization are operating in a new normal of constant disequilibrium, where change is a constant that resides at the core of the ecosystem, and the tensions and tradeoffs it throws off require immediate organizational response to ensure survival. Centre-Leaders function as shock absorbers within the organization by anticipating potential distresses and working from the middle-out to ensure that the organization has the requisite resilience to absorb the shock. What assumptions are inherent in the decisions you make and how might those assumptions be flawed? How might those flawed assumptions negatively impact strategy, execution, change and people? How might you leverage a beginner’s mindset to reframe your context to create, deliver and capture greater value? Having gained insight from more profound perception, Centre-Leaders will develop multiple and varied hypotheses around a given situation. This can often result in deliberation and debate about who has the most accurate perception of the situation under consideration. The reality is that no single individual can hope to fully comprehend the totality of actions and interactions within the system. The ultimate goal of sensemaking is to leverage these varying and differing, internal and external perspectives to create a shared understanding of the larger ecosystem dynamics. 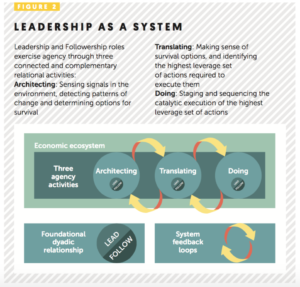 This shared systemic understanding enables Centre-Leaders to identify key leverage points for catalytic action and to develop strategies to influence the organization system in a desired direction. How can you effectively integrate multiple varying perspectives to create a shared understanding of the complexity underlying the issue at hand? What tools and resources can you leverage to develop a systemic understanding of the situational context? How comfortable are you with taking logical leaps of faith and engaging in rapid test-and-learn experiments that have a high likelihood of failure? 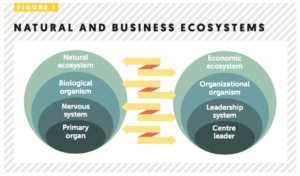 Economic ecosystems and the organizations within them operate through vast and varied network connections that must be influenced and nudged to catalyze action in a desired direction. Centre-Leaders must recognize that the more connected things become, the less direct control they wield. As formal physical hierarchies become increasingly outflanked by informal digital wirearchies, the need to develop network collectives of trusted and trusting stakeholders increases dramatically. Catalytic choreography entails bringing distant and disparate parties together to accomplish a shared goal, decision or action. This requires that Centre-Leaders develop a deep understanding of the varying and competing needs, priorities and interests of stakeholders, and that they address the structural and attitudinal barriers required to catalyze collective action in a desired direction. Have you identified all of the stakeholders that will require influencing to move the organization system in the desired direction? Do you understand the competing needs, priorities and interests of these stakeholders? Have you developed an influence strategy that addresses structural and attitudinal barriers and creates the conditions for catalytic action? Leadership development has evolved into a vast global industry. More than $50 billion a year is spent teaching leaders how to lead, and organizations seem hungry for more. Deloitte’s 2016 Human Capital Study reports that almost a third of organizations have weak or very weak pipelines, and nearly 90% of organizations see this as a strategic business challenge. Yet traditional leadership development practices focused on building individual leadership competence will only yield minimal contribution to the evolution of a VUCA-ready leadership system. Human Performance Technology (HPT) has clearly evidenced that less than 20% of any organizational performance problem is attributable to deficiencies in individual competency. If leadership is systemic and not individualistic, why is our industry spending the bulk of our toil and treasure focusing on the component of the leadership system with the least leverage? Why are we not giving due consideration to improving the performance of the system within which the leader must lead? The answer is simple yet profound. Our entire industry has unconsciously colluded to develop willful blindness to the fact that leaders do not lead in isolation, but are part of a larger leadership system that has more impact on the organization survival than the leaders themselves do. The evidence resulting from our industry’s unconscious collusion is profoundly troubling. Two thirds of organizations today believe their current leadership development programmes only provide “some” or “little-to-no” value. 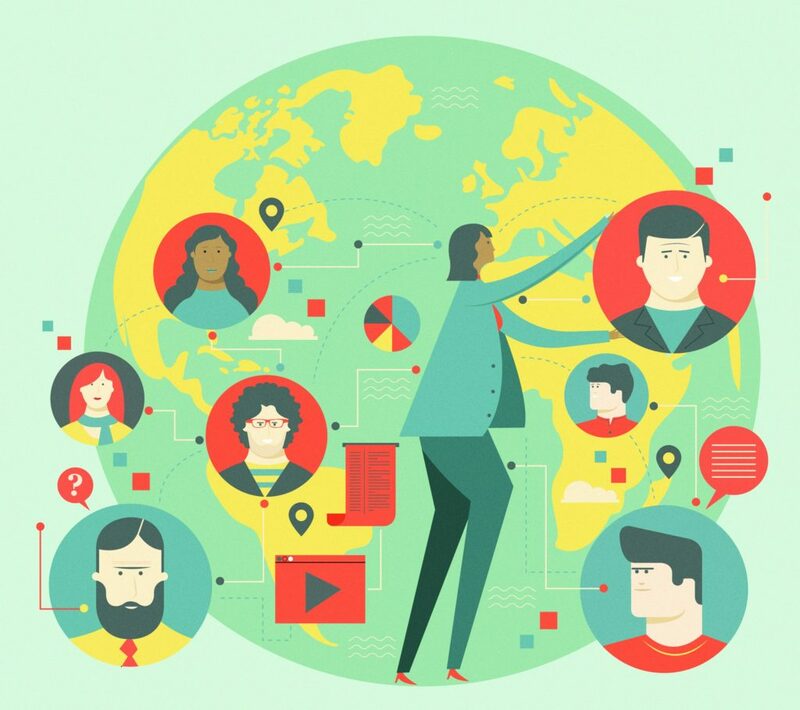 Only 14% of firms describe themselves as “strong” at succession planning, 13% say they are “excellent” at building global leaders, and only a paltry 7% report that they are “excellent” at building Millennial leaders. The leadership development profession needs a complete reboot. The industry must focus on improving the capabilities of the leadership system, not simply the competencies of the individual leader. Organizations must focus not only on the needs of individual fish, but also on the health of the pond they inhabit. In so doing, they will cultivate a deliberately developmental organizational culture that is yielding tangible results. Organizations that focus on the systemic nature of leadership attain 37% higher revenue per employee, 9% higher gross profit margin, are five times more likely to be highly effective at anticipating and responding to change, and ten-times more likely to be highly effective at identifying and developing leaders. To begin our journey towards systemic leadership, we must let go of our obsession with individual leaders and adopt a more holistic perspective of leadership as a system. We must recognize that the design of a VUCA-ready leadership system begins by cultivating collective catalytic action within a group of Centre-Leaders who share a common aspiration to take both their organizations and their people to the next level. From that point, the evolution process takes over and the journey towards evolving enterprise instancy begins to naturally unfold. What are you doing to get ready for what’s next?